This election season, we’re sticking to what we value – and we value drinking beer. 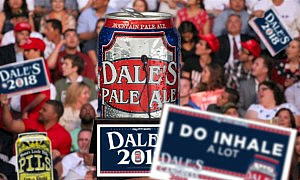 That’s why we’re endorsing Dale’s Pale Ale for CANgress. Dale’s doesn’t care which side of the aisle you’re on – as long as you’re willing to grab a seat at the bar. Dale’s Pale Ale’s opinion on healthcare? The economy? Infrastructure? There are no opinions because this CANdidate is literally a can of beer. Vote DPA this November and Dale’s will put you to work – doing 16oz curls.